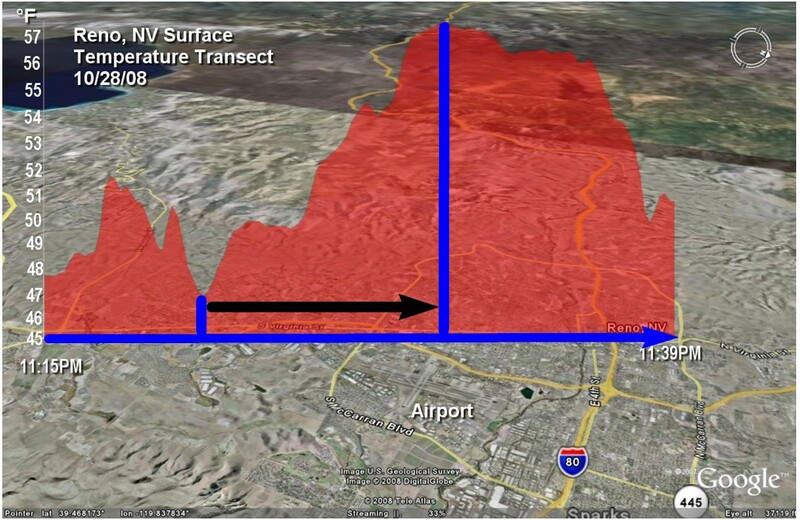 Here is a very good example of the Urban Heat Effect (or Urban Heat Island) which according to the Global warming Hysterics doesn’t exist and in no way influences temperature measurements. It is from Reno, NV. And it shows the difference in temperature from the countryside outside the city to downtown Reno. Wouldn’t you say that this effect is VERY BIG for “not existing”? And don’t you think it has an impact on the official temperature measurements? I have in previous post shown other examples of this “nonexistent effect” . (See Central Park, New York). This entry was posted on 1 februari, 2010 at 10:32 f m and is filed under Fri- och rättigheter, Miljö - Environment, USA, Yttrandefrihet. You can follow any responses to this entry through the RSS 2.0 feed. You can leave a response, or trackback from your own site.